The KIPP Ujima Village Academy has been ranked as the highest performing public middle school in Baltimore since it opened in 2002. 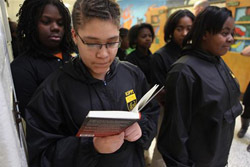 It’s part of a network of 66 KIPP (Knowledge is Power Program) schools nationwide whose mission is to develop students who will be successful through college and beyond. Today we discussed the success of the KIPP Academy and how lessons from the school can be applied to other public schools around the city. Jay Mathews, Washington Post education columnist and author of Work Hard, Be Nice: How Two Inspired Teachers Created the Most Promising Schools in America.